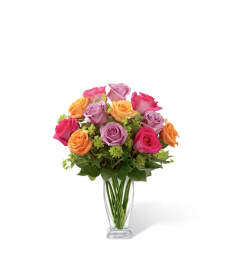 The FTD® Petal Play™ Hand-tied Bouquet has a fresh and fun look that is set to brighten your special recipient's day! Lavender roses, purple carnations, white daisies, violet mini carnations, white Asiatic Lilies, and lush greens are hand-tied artistically by a floral artist to create a stunning flower arrangement. 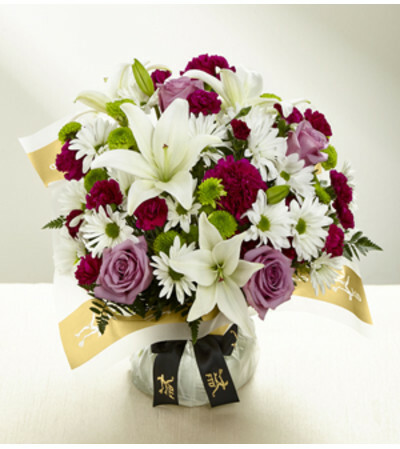 Tied with stylish FTD black and gold ribbon at the stems and wrapped in exclusive FTD floral paper, this flower bouquet is ready to extend your warmest thank you, thinking of you, or happy birthday wishes.